The Korea National Quality Award is one of Korea’s most prestigious business awards and one of the most important quality distinctions in the world. At the end of November ENGEL MACHINERY KOREA won this presidential quality award in the field of production innovation. Furthermore, ENGEL is the first foreign company ever receiving this award in the 39 years of its history. The award was handed over by the Korean Prime Minister Jung Hong-Won and the winners have been honored by the Korean President Park Geun-Hye. The Korea National Quality Award has been introduced by the Korean government to improve quality standards in Korea. It is based on the Malcom Baldrige National Award (USA), the European Quality Award and the Deming Prize (Japan) which underlines the international importance. 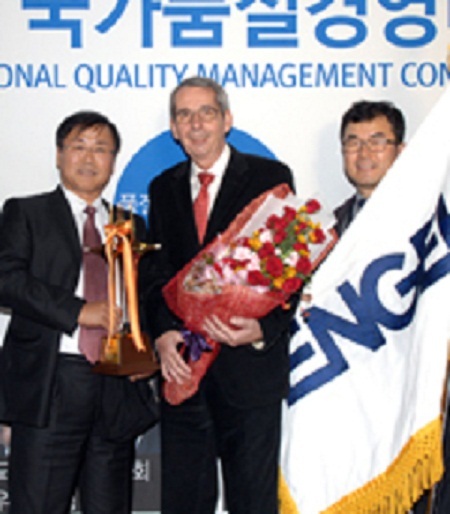 “This award is a great honour for us and also an important confirmation of the fact that we’re on the right track with our global quality management system”, says Robert Bodingbauer, ENGEL MACHINERY KOREA’s president. “Our plant in Pyeongtaek City abides by the same strict quality standards used at our main factory in Austria, and this award highlights the fact that this company motto is being adhered to consistently all over the world.” The outstanding commitment of ENGEL KOREA’s management and employees to implement ENGEL’s global systems has been the main factor to receive this prize.